Are There Rules in Art? Home Open Minds Are There Rules in Art? How useful are rules in art? If it were a science, there would be fixed laws, as in physics and mathematics. If not, is it possible to set rules? Leonardo da Vinci says yes: “Truly this is science, the legitimate daughter of nature, because painting is born of (that) nature. “ And Leonardo gives us a lot of instructions and advice. But before we take them literally, we should consider what the meanings of the words art and science were at the time of Renaissance. The definition of art may have included any skill; those of science any kind of generalized knowledge. Leonardo speaks mainly of the physical and physiological aspects of painting, of perspective, color, light and shade, of anatomy and botanic, of proportions and movement, rather than of esthetic theory he talks of art as imitating nature Yet Leonardo, obviously, does not merely imitate nature. Neither should we. 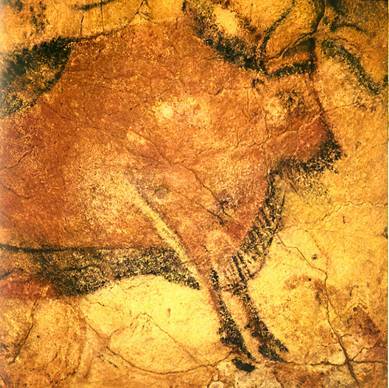 The concept of Nature, and of art as its imitation, was a novelty in his time. There was no concept of the freedom of the artist and of the diverse paths art can take. Light is the part of electromagnetic radiation that is visible to our eyes. It covers a range of wavelengths, from violet to red, orange, yellow, green and blue. Black and white are not real colors in the physical sense. Black is the absence of light, and white a mixture of colored lights. Colors that when added produce white (e.g., green and red, yellow and violet, blue and orange) are called complementary. The characteristics of a color are hue, saturation and brightness. Hue is the type of color: red, blue, etc. The saturation is the purity of the color, diminishing from the pure color to gray. Light can come from objects that emit it, such as flames, the filaments of electric lamps, fluorescent bulbs, the stars or the sun, and from objects that receive light from another source and reflect it (including the sky and the moon). 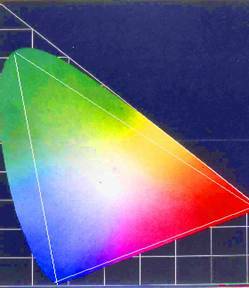 The colors of pigments result mainly from the absorption of certain components of the white light and reflection of the colors that were not absorbed. Given the continuity of the color spectrum, the choice of primaries is somewhat arbitrary. 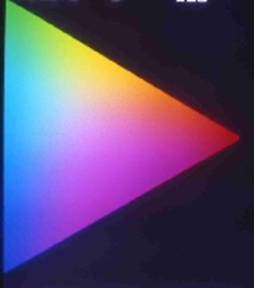 From the point of view of color perception, there are four basic colors, red, yellow, green and blue. Black and white are usually added, and other colors (e.g. orange, brown, purple) are mixtures of these six. The curve inside the diagram of Fig. 5 shows the location of the colors of hot objects, starting with red and moving towards white with increasing temperature. For this reason we call them warm, and this analogy is very good. A painting, with its border and frame, is like a room; although parts of it may hotter or colder, it has usually a predominant temperature, related to the color of the illumination (and the mood of the painter). See figs. 6 and 7. 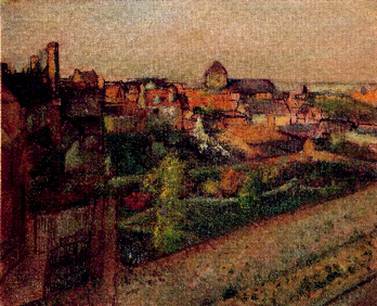 The landscape by Degas (Fig. 6) is limited in the range of hues and brightness; yet is has beautiful colors and a warm atmosphere. 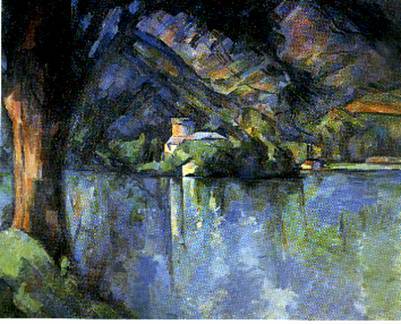 The Cézanne landscape (Fig. 7) in turn, is painted in cool tones. The perceived hue, saturation and brightness of a color are affected by adjacent colors. If surrounded by dark it appears to be brighter, if by warm colors, cooler, etc. Rudolf Arnheim (Art and Visual Perception, U. of Cal. Press, 1974, p.369) believes that the pure colors are neither warm or cold, but that warm or cold colors result from adding other colors to the primaries: red plus a bit of yellow is warm, with a bit of blue it is cool. One could also argue that the concept of warm/cold is due to deviations from an expected local color, which can be attributed to the source of light.